Mario Kart DS's setup is very strong. The main connection process and download take little over 40 seconds with a mini-dowload (10 seconds or less) before each game starts to pull up specific info. The host has more options than the guests (which makes sense). For the guests, everything runs on auto-pilot until the game begins, keeping their focus on the game itself. To keep things simple, all guests always get Shy Guy. To make things a little more special for the guests, Shy Guy is EXCLUSIVE to the Single-Card Download guests. All menu fields are large enough to tap and not hit the wrong option. All menu locations make sense. Go into Multiplayer and create the Simple connection (which, by the way, is described right on the upper screen), then pick which game and which options you want once you're in. Why is this good? This is good because, if you want to go from a Vs race to a Balloon Battle to a game of Shine Runners, you can do so without disconnecting! It really doesn't get much more well put together than this. All of the basic control functions are simple and appropriate. Nintendo didn't try to force touch screen controls on a game that, to put it simply, didn't need them. Everything in the game plays exactly as it does in the single player experience. The controls are intuitive and do exactly what you expect them to, sometimes even giving you options (like the choice of using the "X" button or "L" button for item control). Mario Kart DS's look is terrific, with accurate graphical representations of the Retro Grand Prix tracks, as well as the Pipe Plaza battle arena. 3D elements move well and everything acts as it would be expected to. The animations are terrific (unlock R.O.B., and cause him to spin out by pressing and holding the "A" button before the "2" appears in the countdown! ), both in and out of the races. The sound effects are not only appropriate, they add to the game playing experience. The sound effects let you know when a shell is coming or if something is blowing up nearby. The music is either peppy, ominous, or whimsical, depending on the racetrack/board, and works well with the sound effects. The features are also well done, allowing 1/4 of the tracks in the game, 1/2 of the multiplayer battle boards, and an exclusive racer to be used with the Single-Card Download feature, not to mention several rule choices and victory conditions. I had finally saved up enough money to buy a Nintendo DS (many bills) when holiday time 2005 came around. Fortunately for me, I was able to track down one of the red Nintendo DS systems bundled with Mario Kart DS, making it my first game. I didn't keep track of the number of hours I spent playing, unlocking, replaying, improving, etc. my Mario Kart DS data, but it was a lot. I've been a fan of the Mario Kart series since I bought Mario Kart 64, and have since picked up Mario Kart: Double Dash! and Mario Kart Super Circuit, in addition to Mario Kart DS (I'm missing Super Mario Kart, but that's it). The series is fun and keeps almost everyone amused, regardless of how short their attention span. I'm very much looking forward to Mario Kart Wii (or whatever it will be called) and I with they'd add tracks through online micro-transactions (just a personal hope). Mario Kart DS was the first game in the Mario Kart line to include online play (via the Nintendo Wi-Fi Connection). Mario Kart DS included double the number of tracks of any previous game in the Mario Kart line, half of which are favorite tracks from previous Mario Kart games. The game looks great. The game sounds great. The game plays great. The only criticism is the decision to allow for snaking (see above). I still pull this game out and try to beat my old times. So far, no two Mario Kart games have appeared on the same system (Mario Kart Super Circuit and Mario Kart DS don't count), but I'm hoping that will change with the Nintendo DS. Mario Kart DS set the standard for all racing games on the DS. The only way to beat it? 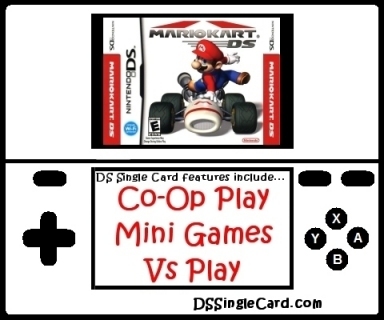 Follow it up with another Mario Kart game on the Nintendo DS!